Tomato, Cabbage, Pumpkin, Squash, Honeydew, Cauliflower, Kale, Potatoes, Blackcurrant, Redcurrant and White currant. Dwarf types make good edging plants that may deter rabbits. Some varieties are known for their ability to starve out rootknot nematodes when planted as a mass. 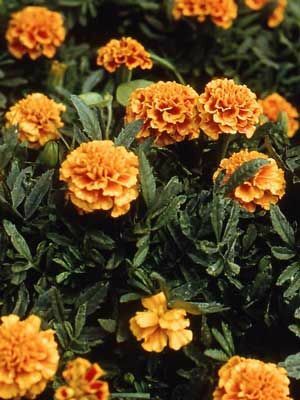 Sow marigolds in spring, or set them out as bedding plants. Broadcast seed into cultivated soil so that the seeds are about 2 inches (5 cm) apart and one-half inch (1 cm) deep. Thin to 8 inches (20 cm) apart in all directions for dwarf varieties; allow 12 inches (30 cm) between very tall varieties. Does Your Vegetable Garden Need to Be Beautiful?